The New York City Fire Department is coming to Guardian Centers in Perry at the end of September for a multi-agency disaster response training event. According to a news release, the training is from September 30 to October 2. The 48-hour training, the release states, will challenge more than 400 first responders to handle a major earthquake at the local, state and federal level. "It's extremely beneficial to have access to a state-of-the-art facility like Guardian Centers to rest and validate our response to a disaster before lives are on the line," the battalion chief of the FDNY, Joe Downey, said in a statement. "To be able to bring together responders from the local, state and federal levels in one place to work together and coordinate our efforts will undoubtedly hone our abilities to respond quickly when called upon." Three men were arrested Tuesday for allegedly attempting to rob a gas station and several homes in Perry. According to a news release from the Perry Police Department, 17-year-old Donnell Robert Stinson, of Perry, 17-year-old Trevion Jamal Richardson, of Perry, and 21-year-old Willie Bernard Collier, Jr., of Byron, are all charged with robbery, criminal attempt to commit burglary, theft by taking and armed robbery. The release states the suspects were spotted near a location where a home burglary had just happened. When officers tried talking to them, they fled on foot. They were chased into the Creekwood Park area where they were later arrested. Richardson and Stinson were also identified, the release says, as being involved in an armed robbery at a Circle 9 convenience store at 423 General Courtney Hodges Boulevard back in July. $45,000 of property was recovered. For the hunting enthusiasts, the annual expo "Buckarama" is back. For more than three decades now, it has brought hunters together to track the latest trends. Hundreds drop in to find the most bang for their buck. This year, about 150 vendors showcased their products. Tommy Holcombe with Wilborn Outdoors references one of their new deer stands. "We've got a double stand for you and your girlfriend or you and your wife," he says. "Which you might not want, because then she'll want to come!" He has come to the show for about 20 years. "Every year we seem to add another booth and another booth." He says even regulars like him can expect to see something new, and it does not cost a lot of dough. On the other side of the Mississippi, it was Route 66, but once upon a time, Macon and Perry had the Dixie Highway. It's still there of course, winding through Macon and Perry, and a historian wants travelers to know the significance of the road beneath their wheels. In 1914, The Dixie Highway Association was founded to bring tourists south. When the interstate system was created in the 1950s, many of those roads were forgotten. A sign along Highway 41 shows the distance to Perry and other towns along the Dixie Highway. The Mossy Oaks Lodge was one of the stops along the route. The remains of the old road running parallel to 41 are still there along with an old bridge near Flat Creek. Sandi Smeltzer with Discover Perry says the Dixie Highway Promotion will help bring people through town. The event brought around 150 people throughout the state together to discuss the state of the Republican party. Handlers and their furry friends spent Friday running obstacles at the Georgia National Fairgrounds in Perry. 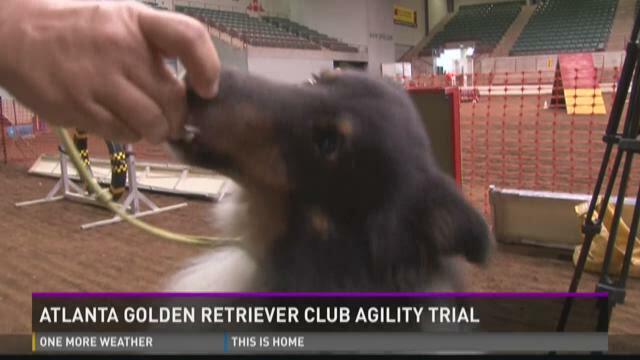 It's all part of the Atlanta Golden Retriever Club's agility trial. But it wasn't just for goldens, dogs big and small got in on the action. Handlers lead their four-legged partners through jumps, weave poles and a tunnel.